Electric heaters come in many different guises, but in the end we all like the idea of a 'real' fire as the centrepiece of our lounging area. The standard coal and log look electric fires are pretty good, but there has always been something missing in the reality of the burning effect. Here we take a look at the latest patented Opti-myst technology from Dimplex to see if they have finally given us an electric replica wood-burner that truly looks and feels the part when in use - with the £600 Dimplex Opti-myst Gosford Stove. Modelled on the design of a standalone wood-burning stove, the Dimplex Opti-myst Gosford Electric Stove is solid and durable in feel and appearance, with a mainly metal matt-black cast-iron effect exterior, and a 17kgs weight to keep it standing firm and steady. The glass-effect door opens and closes on a magnetic catch and all the onboard switches are hidden when in use by a narrow flip-up cover. 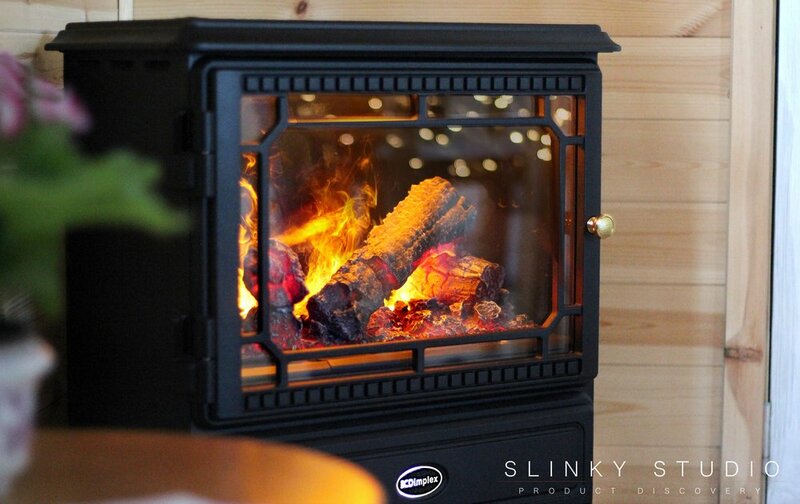 The log effect fuel bed looks authentic on first view, even before the stove is plugged in, and included with this electric stove is a remote control. 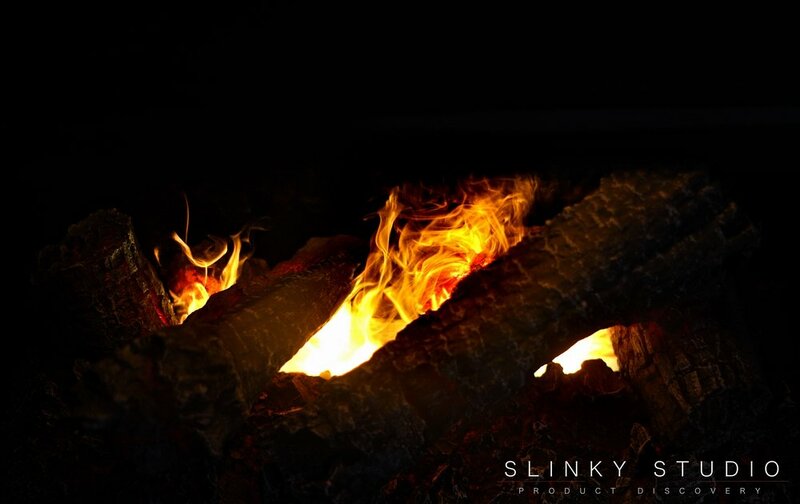 It might seem odd to mention set-up in connection with an electric fire, but the Dimplex Opti-myst system does necessitate that you fill a bottle-fed reservoir of water which lies beneath the log-effect fuel bed. You must also plug in the four coloured LED lights (supplied) which lie behind the reservoir. All this was achieved in minutes by us and from then on we just needed to check the water reservoir occasionally to keep the Opti-myst system working. Their are four controls under the flip-up lid behind the door of the fire: an on/off rocker switch; a rocker switch which is pressed once to turn on the lights and flame effect, pressed twice to turn on the fan heater at 1kw and pressed again for 2kw; there is a wheel switch to set the thermostat and a wheel switch to set the extent of the flame and smoke. Once the flame height and thermostat are set, the remote control (included with batteries) will turn the heater on and off, turn on the light and flame effect and start the fan heater for 1kw power or 2kw power - all of which means you can control the fire from the comfort of your armchair! When the fire is first turned on the orange coloured LEDs immediately light up the logs offering life and realism to their effect. At this stage it already looks good and better than many of its predecessors from our experience, but then you wait for a minute or two while the necessary water vapour heats up and, low and behold, you start to see what truly appear to be real 3D flames and smoke rising from the logs. These gather momentum, exactly like a real fire burning higher as combustion takes hold. It is absolutely amazing and the effect of this alone, without switching on the heater, sets a warm and magical ambience. The 3D shaping of the flames and smoky wisps is random because of the way the water vapour is produced, and by casting light on the thin whisks of misty vapour as they rise, it genuinely looks like real flames and smoke. You can alter the height and extent of the flame effect as well, which means it can appear to be a roaring fire or just a steadily glowing one. We found the whole effect quite mesmerising and we could sit and watch the moving flames and smoke for ages. The actual means of heating is via a fan heater which is under the main wood-burner shape. The Dimplex name is synonymous with good electric heaters of all kinds, and this fan heater is no exception, with two settings offering either 1kw or 2kw of heat which, as previously explained, are thermostatically controlled by a rolling switch under the lifting flap just inside the door. The fan heater pushes out heat at a considerable pace and it soon warms up our cold studio. 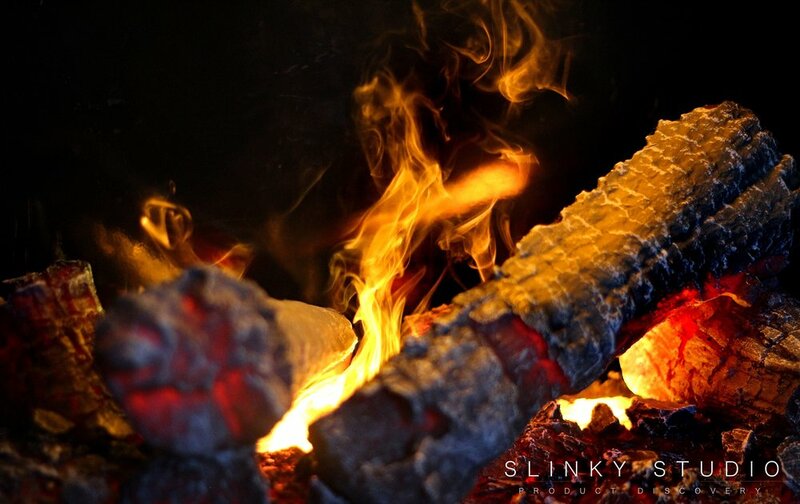 However, there is no doubt that the psychological affect of the incredibly realistic flame and smoke effect also brings with it a very desirable warmth and cosiness that continues to work happily even when the fan heater itself is turned off. Dimplex have certainly made a breakthrough in their quest to produce realistic looking flames and smoke within an entirely electric fire. Their unique Opti-myst technology brings ever-moving three dimensional flames, not through the old method of simply flickering the lights, but via actual rising vapours that appear magically as plumes of dancing flames. At a £600 recommended price and with a 2-year guarantee, we think the Gosford Electric Stove is a clean and safe way to replicate the feel and look of a real wood-burner, with the advantage that you don't need a chimney, it can be moved from room to room and doesn't have the hassle of smoke filled air or having to continuously feed it with logs.